Why Did Audi Stick An Electric Longboard In The Bumper Of A Q3? It is ridiculous, but kind of a cool idea. Audi has unveiled a concept car with a very odd feature. The Connected Mobility Concept is based on the Q3 crossover, but features an electric longboard integrated into the rear bumper. Audi says that this longboard can go seven miles on a charge and reach 18 mph. You can ride it like a normal longboard, or attach handle bars to ride it like a scooter. You can also put it into cargo mode and have it follow you by tracking your smartphone. The board will charge itself when it is stowed in the bumper and will be ready when you need to use it. This idea is really silly. Audi has built an over-engineered piece of art made of aluminum and carbon fiber. Seriously, this board looks beautiful. While the idea may be a bit weird, we are oddly impressed by how cool it is. We doubt that it will go into production, but the idea of an integrated electric scooter would be a pretty good way to get . You could park your Q3 in a garage, then ride the scooter to your office building. Not such a crazy idea is it? At what point can we start calling these things hatchbacks again? The Audi Q3 is the latest premium compact crossover on the market – will that also mean it’s the best? The Q3 goes from being drab and forgotten, to stylish and in-demand. 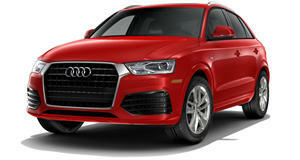 The new Audi Q3 turns out to be almost a Q5 rival.